Music at All Saints plays an integral part in our worship and liturgy. 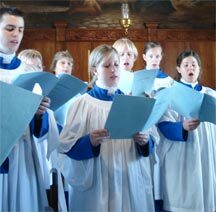 Our music ministry is drawn from the rich musical heritage of the Church of England. The Choir sings Choral High Mass on the 4th Sunday of each month, and Choral Evensong on the 2nd and 5th Sundays of each month. Every other Sunday, mass settings are congregational and vary from time to time. One of the highlights of the year is the annual Songs of Praise for Easter Day, which has become a musical tradition at All Saints. It is a service of poetry and readings combined with favourite choral anthems and hymns. We are very blessed to be joined by members of the Tasmanian Symphony Orchestra for this service.